As global temperatures rise, and the mean sea level with them, I have been tracing the likely flood levels of the Thames Valley, to see which of my literary rivals will disappear beneath the waves first. I live on a hill, and what I’d like to say is: you’ll be stuck with me a while longer than most. But on the day I had set aside to consume David Wallace-Wells’s terrifying account of climate change and the future of our species (spoiler: there isn’t one), the water supply to my block was cut off. Failing to make a cup of tea reminded me of what ought to be obvious: that my hill is a post-apocalyptic deathtrap. I might escape the floods, but without clean water, food or power, I’ll be lucky to last a week. The first half of The Uninhabitable Earth is organised in chapters that deal separately with famines, floods, fires, droughts, brackish oceans, toxic winds and war and all the other manifest effects of anthropogenic climate change. (There are many more than four horsemen in this Apocalypse.) At the same time, the author reveals, paragraph by paragraph, how these ever-more-frequent disasters will join up in horrific cascades, all of which will erode human trust to the point where civic life collapses. The human consequences of climate disaster are going to be ugly. When a million refugees from the Syrian civil war started arriving in Europe in 2017, far-Right parties entered mainstream political discourse for the first time in decades. By 2050, the United Nations predicts that Europe will host 200 million refugees. So buckle up. That such truths go largely unspoken says something about the cognitive dissonance in which our culture is steeped. We just don’t have the mental tools to hold climate change in our heads. Amitav Ghosh made this clear enough in The Great Derangement (2016), which explains why the traditional novel is so hopeless at handling a world that has run out of normal, forgotten how to repeat itself, and will never be any sort of normal again. This is why writers seeking to capture the contemporary moment resort to science fiction. But the secret, sick appeal of post-apocalyptic narratives, from Richard Jefferies’s 1885 After London onwards, is that in order to be stories at all, their heroes survive. You can only push nihilism so far. J G Ballard couldn’t escape that bind, nor could Cormac McCarthy. Despite our most conscientious attempts at utter bloody bleakness, the human spirit persists. Wallace-Wells admits as much. When he thinks of his own children’s future, denizens of a world plunging ever deeper into its sixth major extinction event, he admits that despair melts and his heart fills instead with excitement. Humans will cling pluckily to life on this ever-less-habitable earth for as long as they can. Quite right, too. Wallace-Wells is deputy editor of New York magazine. In July 2017 he wrote a cover story outlining worst-case scenarios for climate change. Its pessimism proved refreshingly tart on palettes dulled by years of mealy mouthed nonsense about “sustainable growth”, and The Uninhabitable Earth has been much anticipated. In the first half of the book, Wallace-Wells channels former US vice president Al Gore, delivering a blizzard of terrifying facts, and knocking socks off his predecessor’s Earth in the Balance: Forging a New Common Purpose (1992), not thanks to his native gifts (considerable as they are) but because the climate has since then deteriorated to the point where its declines can now be observed directly, and measured over the course of a human lifetime. More than half the extra carbon dioxide released into the atmosphere by burning fossil fuels has been added in the past 30 years. This means that “we have done as much damage to the fate of the planet and its ability to sustain human life and civilisation since Al Gore published his first book on climate than in all the centuries — all the millennia — that came before.” Oceans are carrying at least 15 per cent more heat energy than they did in 2000. Twenty-two per cent of the earth’s land mass was altered by humans just between 1992 and 2015. In Sweden, in 2018, forests in the Arctic Circle went up in flames. On and on like this. Don’t shoot the messenger, but “we have now engineered as much ruin knowingly as we ever managed in ignorance”. The future isn’t bleak. The future isn’t there. We’re running out of soil. In the United States, it’s eroding 10 times faster than it is being replaced. In China and India, soil is disappearing 30 to 40 times as fast. Wars over fresh water have already begun. The CO2 in the atmosphere has reduced the nutrient value of plants by about 30 per cent since the Fifties. This book may come to be regarded as the last truly great climate assessment ever made. (Is there even time left to pen another?) Some of the phrasing will give pernickety climate watchers conniptions. (Words like “eventually” are a red rag for them, because they catalyse the reader’s imagination without actually meaning anything.) But Wallace-Wells’s research is extensive and solid, his vision compelling and eminently defensible. 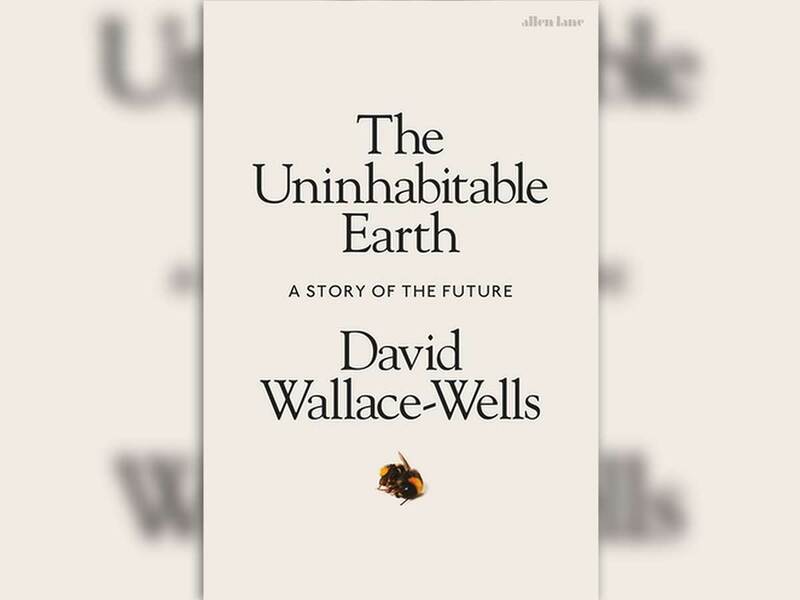 Alas, The Uninhabitable Earth is also likely to be one of the least-often finished books of the year. I’m not criticising the prose, which is always clear and engaging and often dazzling. It’s simply that the more we are bombarded with facts, the less we take in. Treating the reader like an empty bucket into which knowledge may be poured does not work very well, and even less well when people are afraid of what you are telling them. “If you have made it this far, you are a brave reader,” Wallace-Wells writes on page 138. The second half of The Uninhabitable Earth asks why our being made aware of climate disaster doesn’t lead to enough reasonable action being taken against it. There’s a nuanced mathematical account to be written of how populations reach carrying capacity, run out of resources, and collapse; and an even more difficult book that will explain why we ever thought human intelligence would be powerful enough to elude this stark physical reality. “How widespread alarm will shape our ethical impulses toward one another, and the politics that emerge from those impulses,” he says, “is among the more profound questions being posed by the climate to the planet of people it envelopes.” My bet is the question will never tip into public consciousness: that, on the contrary, we’ll find ways, through tribalism, craft and mischief, to engineer what Wallace-Wells dubs “new forms of indifference”, normalising climate suffering, and exploiting novel opportunities, even as we live and die through times that will never be normal again.